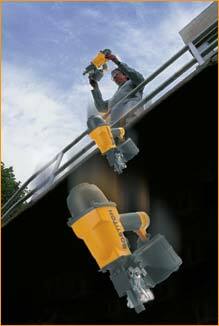 BOSTITCH tools have to withstand some of the most challenging working environments and jobs possible. From construction sites to manufacturing sites, they are in constant use and have to survive being dropped, dragged and generally knocked around in the baking hot and freezing cold without failing. Nobody can afford tool down time these days. BOSTITCH go to extremes to ensure that every tool bearing its name is more than capable of withstanding the challenge so that it will provide years of safe, reliable and trouble free service their users. Our team of over 100 highly trained and experienced engineers and testing staff design and test every machine with safety, reliability and durability in mind and no detail is overlooked. Repeated dragging or dropping of tools onto a variety of surfaces including concrete, timber, hardboard etc. BOSTITCH tools. The ultimate in quality, durability & reliability.